All my posts are provided "AS IS" with no warranties, and confer no rights. In this article i am explaining how could we attach a custom master page to Personal sites in MySite Host. 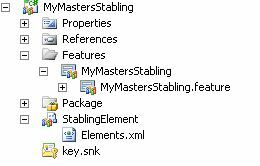 I have created two Sharepoint Project named MyMasters and MyMastersStapling using Visual Studio 2010. * How to deploy custom master page ? * How to customize a masterpage ? * How to attach custom master page to personal sites using staping feature ? * How to set wellcome page programmatically ? * How to add document library as a web part to a page ? 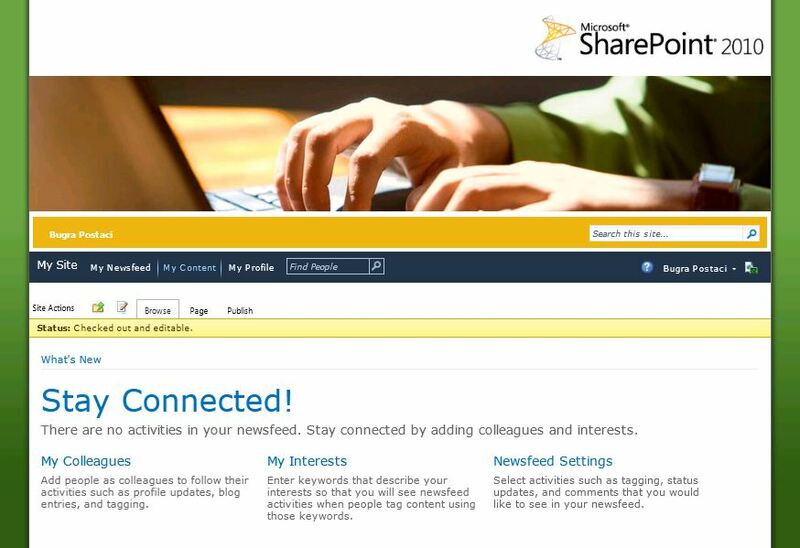 MyMasters Project: is a sharepoint project that deploy a custom master page to a sharepoint site. First i created a site scope feature named “MyMasters” and and a feaurereciever .The important part is here the feature guid . You need this guid for feature stapling configuration. you can get the feature guid from Feature manifest file. 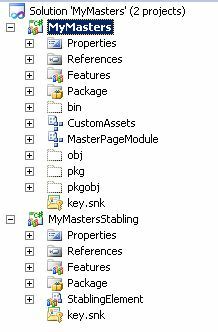 And I have create two modules MasterPageModule and CustomAssests Module . MasterPageModule : contains masterpage file and when the feature is activated it deploy master page the masterpage library under _catalogs folder. CustomAssests : contains necessary css , js and image files. 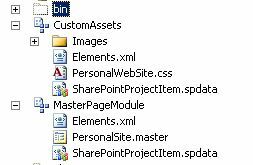 when the feature is activated it deploy assests to Style Library List of target site by creating specific folder for each asset type. Here is the code of Feature Reciever. // Uncomment the method below to handle the event raised after a feature has been activated. // Uncomment the method below to handle the event raised before a feature is deactivated. // Set the Publishing Master Page our custom PersonalSite.master page. So in Feature reciever -> ApplyTheme() function we set two master page first one is V4.master the orginal master for System masterpage and our custom master for Site Master page. As you know you have to enable Publishing Features for the site if you want to this deplotment work correctly. The FeatureSiteTemplateAssociation element maps feature GUIDs to site defintions – note that the format of the TemplateName attribute value is <SiteDefName>#<ConfigurationID>. This obviously allows a degree of flexibility and allows you to do fairly complex things with different configurations of site definitions. As you now at the beginning of article we highlighted a GUID the feature of MyMasters. The third item is using this guid 09c222f7-68ed-4278-a3ce-d64b8dbfb168 .What about first two ? these feature ids are blong to Publishing Features. First one is “Publishing Feature Site” feature’s id at site level and the second one is Publishing feature’s id at web level. For Template name SPSPERS is the personal site template name. for #Zero i am attaching the default configuration. For More information about site templates. So far so good. After you deploy our stapling project and activate the feature , the users can able to see our custom master page even if self site creation is enabled for personal sites . Using Distribution Groups in SharePoint for securing SharePoint securables is not possible. Working with Microsoft Support; Explaining terms that Microsoft Agents using.